The technical issue that the participants of the Turkic Wikimedia Conference in Almaty asked me about more than anything else is migrating templates from bigger Wikipedias. MediaWiki Templates are one of the most important tools for writing Wikipedia articles more effectively and for making them informative, eye-pleasing and easier to read. For the article writers, however, templates are a nightmare. 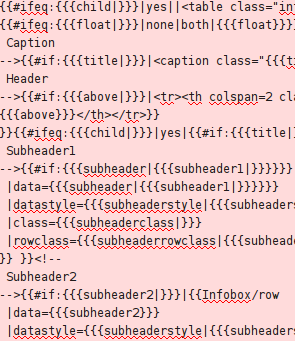 Their syntax is horrible and unreadable; it’s hard to write them, hard to use them and hard to modify them. The fact that so many people nevertheless do it is quite astounding. The guts of Template:Infobox in the English Wikipedia. This is the horrible, unreadable and unmaintainable code behind the nice boxes that you see on the sides of Wikipedia articles. This problem is not new. MediaWiki developers are more or less aware of it, and over the years they have been trying to solve it in various ways, but until now this didn’t actually happen. A partial solution may come from the Wikidata project, but it is just beginning. Also, some time soon the Lua programming language may became usable as the new template language that will gradually replace all those curly brackets. However, that will take time, too, and by itself it will only improve the readability of the syntax and maybe the performance, but it won’t provide an easy solution for internationalization. All I could say at this point is that I’ll try to pass the word on and remind the developers of the importance of this issue. In the master class I demonstrated how to translate Wikimedia software. People opened accounts and started translating MediaWiki and the Wikipedia Mobile app. During the master class several issues were raised. Some of them turned out to be technical issues of translatewiki.net. I intent to find a solution soon. After the translatewiki.net master class I had a relatively short, but really fantastic meeting with Akytbek, a Kazakh speaker from North-Western China. He told me that two million Chinese Kazakhs are well-connected to the Internet and that they vigorously use the Kazakh language online. (According to official Chinese data, there are 1.25 millions Kazakhs in China, but whatever the number is, it’s a lot of people.) That is good, of course, but they only do it only in the Arabic alphabet, and not the Cyrillic, which is used in Kazakhstan. He said that there is a great potential of having many Chinese Kazakh contributors to Wikipedia, and that even though the Kazakh Wikipedia already supports the Arabic script, some improvements are needed to realize this potential. I showed Akytbek our current language tools – the automatic script conversion, WebFonts and the Narayam typing tool, and we decided to work together to adapt them better for the needs of Chinese Kazakhs. By the way, Akytbek didn’t speak any Russian and he knew little English, so another Kazakh speaker who knew Russian acted as an interpreter. This is yet another proof of the importance of never assuming anything about languages and people. According to the schedule, the same morning I was also supposed to hold a workshop for programmers that would introduce them to MediaWiki development. The workshop did not take place at its scheduled time – network problems spoiled the opportunity. However, as it is so important, we did not give up and held it later at the hotel where we were staying. It was intense, and intensely good, too: Talented and experienced people from Turkmenistan, Kyrgyzstan, Bashkortostan and Kazakhstan sat and listened to me talking for two hours or so about MediaWiki configuration, special pages, i18n files, installation procedures, extensions, preferences, templates, bots, source control and so on. Because of the quality of the questions, I am sure that my presentation was understood. What made me really happy is that several people asked how they could contribute patches and new features. At the Turkic Wikimedia Conference 2012 my second talk was about local Wikimedia chapters. That is a somewhat surprising topic, because chapters are separate from the Foundation, which I came to represent, but apparently there was great demand for it among the participants: The organizers asked me to do this a few days before the conference, and in the opening mingling before the actual conference program started people from Azerbaijan, Turkey and other countries asked me about this. So it was clear to me that such a talk would have value and that it can contribute to the development of the local communities. To make sure that people from Turkey would understand me, I wrote bilingual Russian and English slides. I explained what chapters are (and what they aren’t), what they do, and how they are funded. I also added a few colorful slides from a presentation about the chapters’ activities, which Lodewijk Gelauff made in Wikimania 2011 in Haifa (thank you so much, Lodewijk). People in the audience asked whether it’s possible to have a local chapter in a country that already has a national chapter – something that is very relevant to Russia, which is the biggest country in the world and which has many regions with diverse cultures. I replied that it’s basically possible (see Wikimedia New York City), but should be discussed with the Foundation and the national chapter. People also asked about funding – how “non-profit” must a chapter be? Can it, for example, provide services that are related to the Wikimedia mission for a fee and use the income only to advance the same mission? I am not a lawyer but it may be possible. It is also something that should be discussed with the Foundation and that it also depends on the laws pertaining to non-profit organizations of each country. 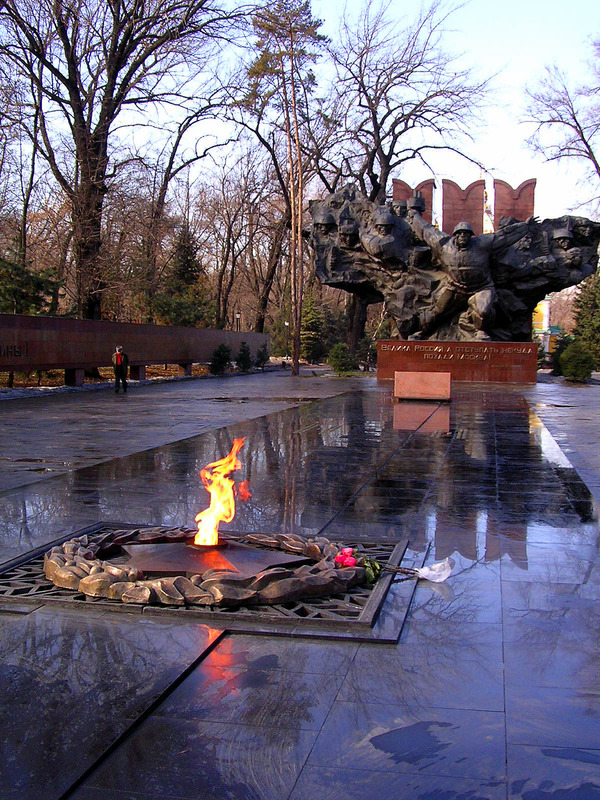 The monument in the Panfilovtsy park in Almary. It's very Soviet, but mostly in a good way. Photo by Roman Plischke, licensed under CC-BY-SA 3.0. In the evening of the first day I had a walk in the Panfilovtsy park with several participants and had very interesting talks about Open Science and about software localization. I was very pleasantly surprised by the fact that people in Kyrgyzstan are so well-familiar with localization platforms like Pootle, Google Translator Toolkit, GlotPress, with the localization sites of Facebook and Twitter and even with localizing mobile phones. I was less pleasantly surprised by the fact that the same people didn’t know anything about translatewiki.net, Wikimedia’s main localization website, which can do things that are very similar to the above-mentioned products, and in many cases it can even do it better. This means that we have to work more to publicize it. 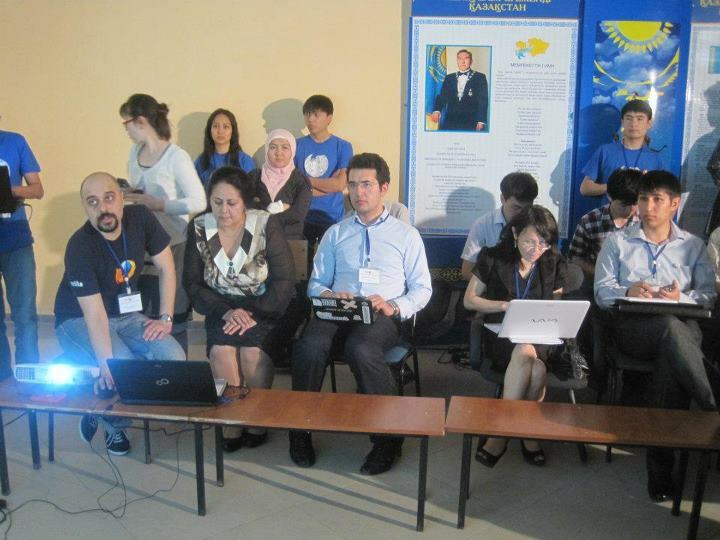 The first Turkic Wikimedia Conference in Almaty, the largest city of Kazakhstan was held last weekend. Turkic Wikimedia Conference 2012 logo by Batyr Hamzauly. The design of the "TWC" letters is based on Old Turkic runes. licensed under CC-BY-SA 3.0. “Turkic” refers to Turkic languages. The most prominent Turkic language, in terms of number of speakers and international awareness of its existence is Turkish, the main language of Turkey. There are, however, many more such languages; Most of them are spoken in Russia and other countries of the former Soviet Union, and a few are spoken in China, Afghanistan and other countries. There first sign of this conference was given in Jimmy Wales’ closing speech of Wikimania 2011 in Haifa. By coincidence, in the same speech Jimmy’s pointer broke down, so I came up on the stage to push the button that moves the slides for him. At some point he asked me not to go too fast, and then he praised Rauan Kenzhekhanuly – the head of WikiBilim, a Kazakh association of people who contribute to Wikipedia, which expanded the Kazakh Wikipedia by many thousands of articles. He was so impressed by their activities that he promised his support for holding a regional Wikimedia conference, and now it happened. Even though Russian is not a Turkic language, it is the most common language for the majority of the conference participants. As I am one of the few Wikimedia Foundation who speaks it, I was invited there. At the conference I delivered several talks. The first was one of the opening keynote speeches – “Why you should write Wikipedia in your language”. In the talk I repeated my usual thesis – writing content and developing software in your native language rather than in a major language is important not just because of nationalism, politics or ideology, but simply because many people don’t know major international languages and thus they cannot access information if it’s written only in a language they don’t know. Before this talk I was told that even in Kazakhstan, where most people know Russian, native Kazakh language speakers often find it easier and more natural to read in Kazakh, especially when it comes to textbooks in schools and universities, and this went along perfectly with what I tried to present. In that talk I also mentioned practical things that can help people to write in their languages and to join the global Wikimedia community – our mailing lists and our language support tools. To make it more entertaining and memorable, I said a few words in Hebrew to give the audience the feeling of bewilderment when encountering a foreign language, and told people to stand up and sit down if they know this or that language. Beyond having fun, this little game also had a practical purpose: I delivered most of this talk in Russian and I wanted to make sure that everybody understands me. People from Turkey and other non-Russian-speaking countries were present in the audience and even though there was simultaneous translation into English, I wasn’t completely sure that they understand me. People laughed and applauded, so I guess that it worked. My answer to the question “will Wikipedia ever carry advertising” was “NO”. This also received thunderous applause.